NASA Earth Observatory image by Michael Taylor and Joshua Stevens, acquired January 31, 2018. Motivated by the complex shoreline, a group of researchers led by Florida State University’s Jaap Nienhuis used simple models of river profiles and coastline evolution to understand the delta’s development. 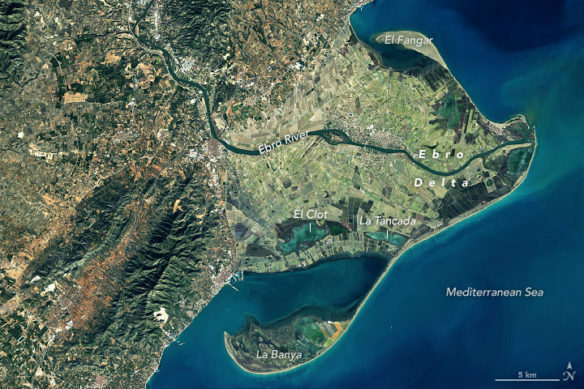 The authors established that rapid changes to the Ebro Delta began about 2100 years ago, and their results were published in Earth Surface Dynamics. “There is a lot of information hidden in that shape complexity that we knew might tell us something about what the delta looked like in the past,” Nienhuis said. Humans, who indirectly drove the growth of the delta over the past 2100 years, are today starving the delta. The waters of the Ebro River have been diverted for irrigation, so sediment dynamics have drastically shifted. There are now 187 dams on the river, and most sediments now settle in front of dams instead of reaching the sea. The loss of sediment deposits from the Ebro River means the modern Ebro Delta is now wave-dominated. River damming, combined with sea-level rise and land subsidence, are predicted to take their toll—40 percent of the delta could be submerged by 2100.